His cloak reminds me of a fiddleback "apron" chasuble. No-one emerges from the baptismal font magically knowing everything there is to know about Orthodoxy. A great effort is made by many to devour books and patristic writings. Is it too much to expect that people also put at least some effort in learning what icons teach? I don't know the story behind the icon. I am newly orthodox so I don't have a whole body of symbols of icons at my disposal. But I see the icon, and know he is going to give birth to the Theotokos. Because even non orthodox have seen an icon of Our Lady, with Jesus inside her stomach. A bit more advanced icon folks might have seen Saint Elizabeth with Saint John or Saint Anna with the Theotokos. And that he should contact TLC the tv channel so they can run another installment of 'I am a man and pregnant' on their network. I do, and I believe you do as well, which is why I'm surprised at your evaluation of the image in question. Anyone familiar with the story of Guadalupe, who sees an image of a native wearing a garment with an image on it, and can read the inscription "Saint Juan Diego" can make the necessary connections. None of those is "San Juan Diego, father of the Mother of God, miraculously conceived in his womb, pointing to her as the Savior and Redeemer". To read all that into the image requires a considerable amount of ignorance of the event depicted and/or intentional misreading and misunderstanding. If the underlying premise of your argument is "Icons are Eastern Orthodox, and no one should ever have anything to do with them unless they are Eastern Orthodox", then just say that. But to take what is a non-Orthodox image painted by non-Orthodox Christians to depict a non-Orthodox event for non-Orthodox people and to criticise it along the lines you did is otherwise nonsensical. There are a number of canonical icons which could be opened up to scrutiny if we want to go down that road. I also find it telling that you did not answer Fr Lance's question, which was about as straightforward as it gets. Rather than explain to him how this particular image could be painted to conform to the iconographic norms you are familiar with, you simply reiterated your original criticism and went on to lambast bad icons and the iconographers who paint them. If it can't be painted properly at all, then just say so and explain why. But that wasn't to be found in this thread either. I'm sorry, LBK, but Denise refuted nothing and neither did you. I'm open to refutation, but it must actually refute, not just repeat. Yesh will be overjoyed to know we are giving up on that whole icon thing because we modern folks are just unable to learn what the symbols all mean. Yet the painter of this image has used specific, established iconographic symbolism, whether in knowledge or ignorance, resulting in the message of the painting to be a distortion of even the RC story. Is this so difficult for you to understand? Not "telling" at all. Do you answer every single question or message directed to you? However, I will give you an answer: From the Orthodox perspective, no, this story cannot be depicted in any way iconographically, as it is outside Orthodox tradition, and San Juan Diego is not an Orthodox saint. As for how RCs and BCs choose to do with it, there are countless paintings of the Virgin as described in the story. If they're content with painting the image on the cloak, so be it - but calling such images icons in the true sense of the word is still a stretch. What is completely unacceptable is the depiction posted earlier. I do not need to repeat myself in stating why it is so. No, that's not my intention. I don't think the only choices are "PhD in iconology" or "burn them all with fire". Yes, and I have a graduate theological degree, so I'm not yet convinced that it's just because I'm too slow. AFAIK, there is no established iconographic way of depicting a native American, his typical clothing, or the image of Guadalupe. To attempt an icon of this subject already involves some interpretation, application, and adaptation of established norms. But to focus on an image "suspended in 'robe form' over someones tummy...leaving in doubt if its a 'worn item' or a rendering of whats inside the person" and then conclude that the entire icon teaches that Juan Diego miraculously conceived Mary in his womb is as ludicrous as seeing the icon of our Lady on a bishop's panagia and assuming that he miraculously conceived Mary in his womb. It seems fairly obvious that context plays a role in interpretation, but these arguments are more akin to "sola icona". OK. Now we are getting somewhere. I agree with this. What is an icon "in the true sense of the word"? For instance, is the only true icon an Eastern Orthodox icon? What is this "true sense"? St Peter the Aleut is an Orthodox saint, with a great many icons painted of him. We also have the saints of Hieromartyr Mitrofan and the Martyrs of the Boxer Rebellion, all painted as ethnic Chinese, with the laymen in the composition wearing traditional Chinese dress. But to focus on an image "suspended in 'robe form' over someones tummy...leaving in doubt if its a 'worn item' or a rendering of whats inside the person" and then conclude that the entire icon teaches that Juan Diego miraculously conceived Mary in his womb is as ludicrous as seeing the icon of our Lady on a bishop's panagia and assuming that he miraculously conceived Mary in his womb. A bishop's Panagia painted on an icon is clearly a medallion on a chain. It is neither a miraculous image imprinted on his vestments or riassa, nor symbolic of conception or incarnation. St Peter the Aleut is an Orthodox saint, with a great many icons painted of him. Is the depiction of St Peter the Aleut the iconographic standard for all native Americans, or just for an Aleut? How would one paint a native American from the town of Cuauhtitlan in Mexico? In other words, context plays a role in interpretation. How would one paint a native American from the town of Cuauhtitlan in Mexico? I have no idea. I am not an expert in Mexican ethnography. I also fail to see what this question has to to do with the acceptability or otherwise of the San Juan Diego painting being discussed here. Depiction of eternal truths, the fullness of which is found in Orthodoxy. Of the revelation of God, most potently through His incarnation. Of being in time and beyond time, simultaneously. Painted in a non-naturalistic, abstracted style to reflect heavenly, spiritual reality, not bound to the earth and the world. Prayed to and venerated, in honor and supplication to him, her or those depicted. Painted with prayer and fasting. Painted not according to the artistic whims of the painter or his patron, but in obedience and service to the Church. Painted in full harmony with the liturgical deposit of the Church. An indispensible element of liturgical worship. This is by no means all there is to it, only a start. "Shlock" means blasphemous or something, right? Anyway, I saw an icon for Harvey Milk, Joseph Stalin, and Putin once. Umm, Antonis, that is on the back of the vestment. Last time I checked, bishop-saints are shown in frontal or, occasionally seven-eighths or three-quarter profile in their icons. Schlock, for the purposes of this thread, means something that might look like an icon, but is completely worthless for veneration. Blasphemy and irreverence often comes into it. IIRC DeniseDenise provided a dictionary definition of the word somewhere in the thread. Have you gone through all of this thread, Amatorus? You'll find those and more on it. Okay, how about the front? I have plenty more examples. P.S. Please source where you've found that was the back, because all of mine say it was actually the front, such as this handy picture, which identifies it as such in the lower left. Grasping at straws? Hardly. Episcopal vestments are often festooned with icons front and back, to this day. Show me an icon of a bishop-saint that shows a large motif of Christ or the Mother of God surrounded by a mandorla over his body. You just skip from one argument to another every time you are proven wrong. Why did you object and say the icon was supposedly on the back of the sakkos if it didn't really matter at all if "Episcopal vestments are often festooned with icons front and back, to this day"? It doesn't make any sense. You just create one convoluted argument after another until your counterpart gives up from frustration. On the contrary. Iconography is not photographic representation, but a depiction of spiritual transfiguration and heavenly realities. All you've done is post pictures of episcopal vestments with icons on them. For your "argument" to hold water, show me an icon of a bishop-saint that shows a large motif of Christ or the Mother of God surrounded by a mandorla over his body. Yea, yea. You just repeated what you said in the last post with some more verbiage. Fact, obviously, thus? Yet when it was a tilma hanging in front of a Mexican, the only possible interpretation was that he was pregnant with the Theotokos. The fact that the subject depicted is a man should've been enough to eliminate this false interpretation, but it wasn't. What makes jewelry so special? Everyone seems to know that I don't know enough, but when I ask questions, I get anything but solid answers. Who knows indeed. What I've gathered is that it's plain to a blind man when a saint is holding a piece of cloth, but only the most pious of Orthodox hawks could see when it's draped over a man's shoulders. Edit: He would see, and he would disapprove. When I stated that, to my knowledge, there was no iconographic standard on how to depict a native American, you referred me to icons of Aleuts and ethnic Chinese. I didn't know what that had to do with Juan Diego, so I brought it back to that. I do see a difference in the two, but it's obviously not the difference you have in mind, which is why I'm pursuing this topic. I'm trying to understand and learn from someone who claims expertise in the field. An image of the Theotokos on a bishop's pendant on an icon of a bishop-saint is basically a bishop wearing an image of the Theotokos. Juan Diego wearing a tilma with an image of the Theotokos on it is basically Juan Diego wearing an image of the Theotokos. How come the bishop is wearing jewelry and Juan Diego is miraculously bearing Mary in his womb? What makes jewelry so special? See above. If you can't see the difference between a pendant on a chain depicted on an icon which speaks of the episcopal rank of the saint, and an ancient established theological iconographic symbol, there's little more to say. Mor, either you're genuinely seeking to learn, or you're taking this line of questioning as a mere intellectual exercise. Which is it? I suppose people could get the wrong theological ideas and start to think bishops were bearing homunculus panagias in their bellies. Edit: I've also noted you haven't responded to my earlier question. The archangel is vested as a subdeacon. Crosses are common motifs in omophoria and oraria, as are icons in medallion form. 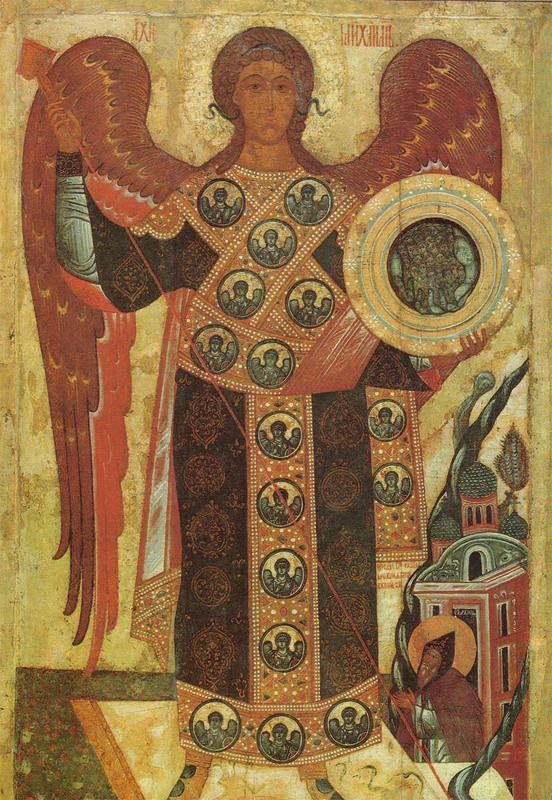 Deacon's oraria in icons also are shown bearing the words Holy Holy Holy, as is also seen on the oraria of angels serving at the heavenly liturgy in icons and murals of this theme. Who's grasping at straws now? Remind me what this question was. The fallacy of your insistence that I am wrong is right there in the section you've bolded. And I'm still waiting for you to post an icon of any bishop-saint shown in the manner I've described. St Peter the Aleut was a native American. San Juan Diego was one as well, though of a different nation. You still haven't explained the relevance of Juan Diego's ancestry in the discussion of the contentious image. Must I repeat the visual and theological difference between a pectoral pendant in an icon, and a depiction of Christ or the Mother of God surrounded by a mandorla over a saint's body in an icon? I'm sorry Mor, ISTM you're just arguing for the sake of it. Since I threw a wrench in the mix about RC saint Juan Diego, here's another weird icon. Enjoy. Is iconographicaster too much of a mouthful? It would mean, you know, a pretender, analogous to a poetaster. Dunno, but a wise soul here once coined the word schlockodoxy. and a depiction of Christ or the Mother of God surrounded by a mandorla over a saint's body in an icon? But that's not what the St. Juan Diego icon is portraying. It is showing an image of the Theotokos (surrounded by a mandorla) affixed to a tilma. The tilma is being worn by the person depicted. I'm not sure I see a qualitative difference between that and an image of the Theotokos in a pendant, with the pendant being worn by a person depicted. In neither case would the icon be attempting to affirm something theologically similar to Our Lady of the Sign. I think this is what Mor is getting at. Unfortunately, your conclusion cannot be sustained. The incarnational imagery of the Mother of God of the Sign is ancient, distinct, unmistakeable, and definitive. Moreover, the Mother of God should not be surrounded by a mandorla in icons. Mandorlas, a round or almond-shape blaze, represent the uncreated light and glory of God. The Virgin was graced by divinity in that she bore the Divine. She is indeed the most exalted being God ever created, or will ever create. It is for this reason that her icon is painted high above the altar in the apses of Orthodox churches. However, this fitting exaltation in no way implies any divinity on the part of the Virgin, she was human and mortal like any human being. She is as close to God as it is possible for a mortal but deified human being to be, but to show her surrounded by a blaze of uncreated light speaks of her being equal to God, which is simply untrue.